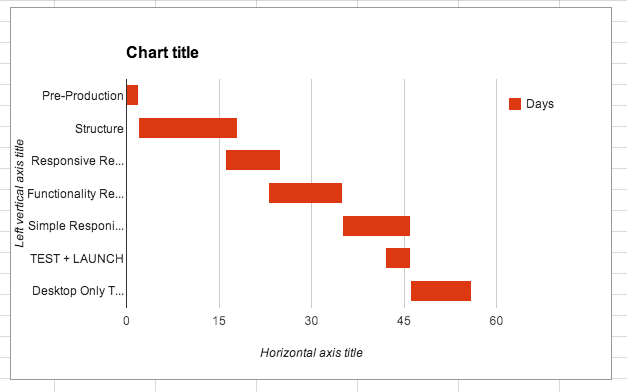 Here’s a little trick to make a super-basic Gantt Chart / timeline graph using Google Sheets. Quick start: Basic Gantt Chart template. Disclaimer: This is not a powerful management tool nor a replacement to timeline project software. This simply displays a spreadsheet chart in a Gantt-like style. Prerequisites: Google account with access to Google Drive (AKA Google Docs) and a working knowledge of spreadsheets. 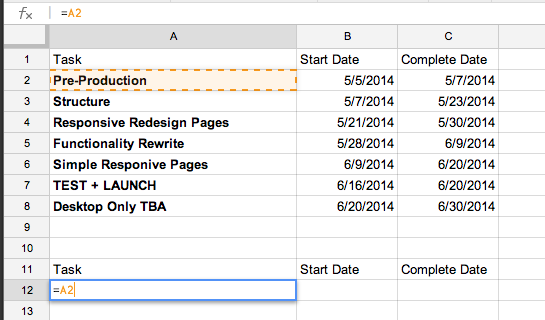 Create a new spreadsheet with three (3) columns — Add tasks with respective start and end dates. 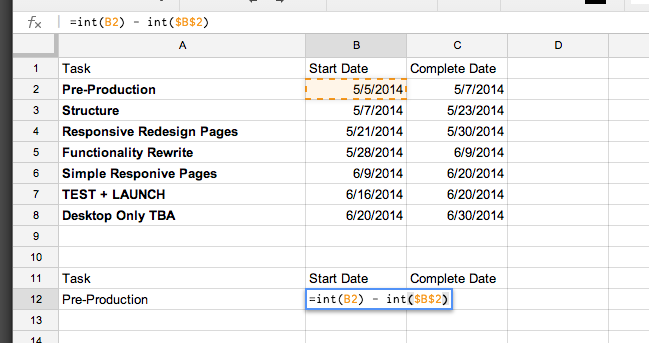 Copy & paste headers below your data — Add formula =A2 to copy first row/column of tasks. Convert dates to days with int() function — Subtract the constant Start Date days from self (and other days) to convert all dates into project days and task days. NOTE: Using $B$2 will make the value static and always represent that cell, so when we paste into other columns, it will remain the start date cell value. Find the number of days the task is projected to take by subtracting converted Start Date days from converted Complete Date days. Copy the row by selecting the first three columns of data, then dragging the bottom right corner down 6 rows. 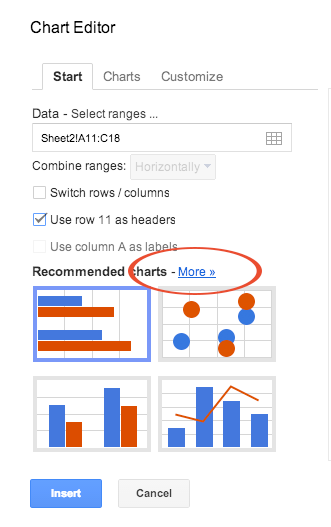 Select the data range then click “insert chart” icon or select menu item. The chart now shows only the days a task will take. Edit title and axes as needed. 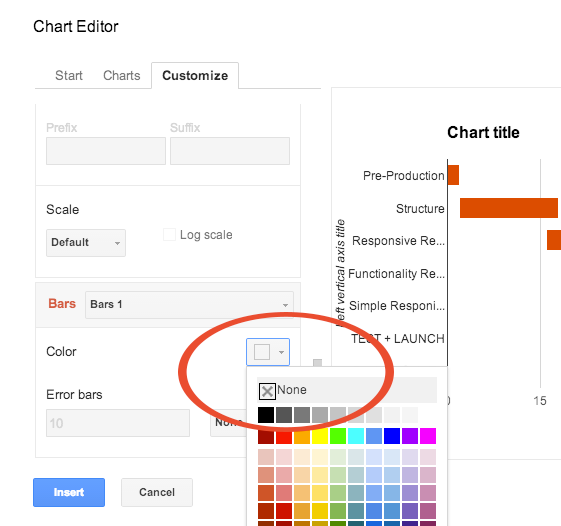 Since we used formulas to create chart data, simply change dates next to tasks and the chart will update automatically. Let me know if this tutorial was helpful. I’d love to hear how you’ve implemented or improved upon it. 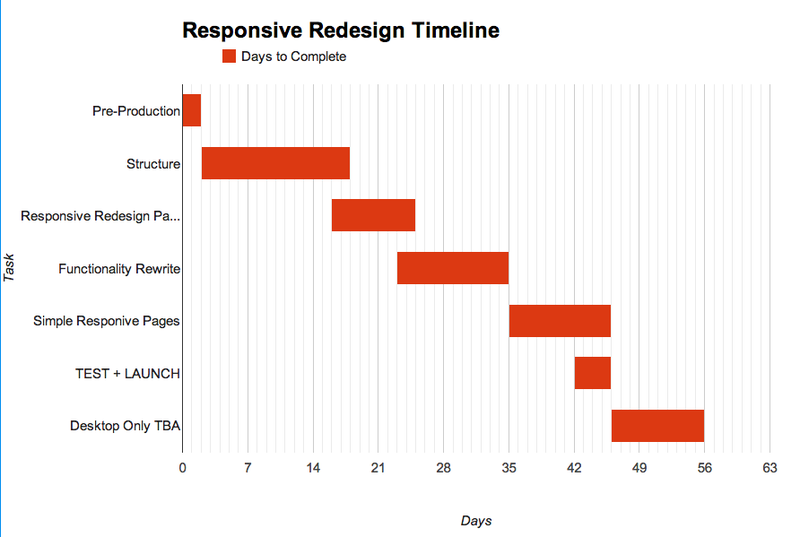 Try it: Basic Gantt Chart template. Great! Wish Google would focus a bit more on their docs to build these basics in. For tracking, you can add a 3rd column “Now”. Add a first row “Today” which starts at 0 and goes out the number of days until the present. Any project that has completed or not started has a third column value of 0. Any project that is late has int(today) – int(complete date). First column has no color, 2nd column has green and third column (lateness) is in red. Great idea Barry. Thanks for the comments. Right on Aksam! — It’s not a full-blown, feature-rich solution, but gets the job done in a pinch. My end dates returned negative values, but the duration was accurate. So I pre-pended the formula with absolute value like this ABS(value). Then it worked great! This is a great idea! Thanks for sharing it. 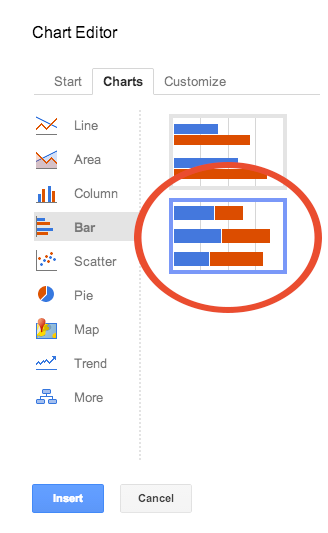 I was anyways looking for online tools to make gantt charts quickly but it seems google spreadsheets can just do it using this method. Thanks for the detailed step by step! I was able to get the basics done. Now, is there a way to individually change the color of each bar? Hey Martin, Thanks for the feedback. Since this is a hack, we’re not able to change colors of individual bars. Each dataset can only be assigned one color — we’re using a trick with two datasets one with color and the other as transparent. The best we can do with real dates is via annotations. (See the comment and screenshot I left for CronFizzle about a year ago). This is just wonderful. Gets the job done without too much hoopla. Thanks! Jay, glad you liked it! are you able to do a tutorial on how to make the horizontal axis a date instead of using annotation? Thanks! I have lengthy task names, how do I get the chart to list it whole? Please help! Without seeing it I suggest changing font size or add a legend?… if you post an example (via screenshot) I might be able to provide better options.